The West wind blows in Galway but the slots just keep on paying out. 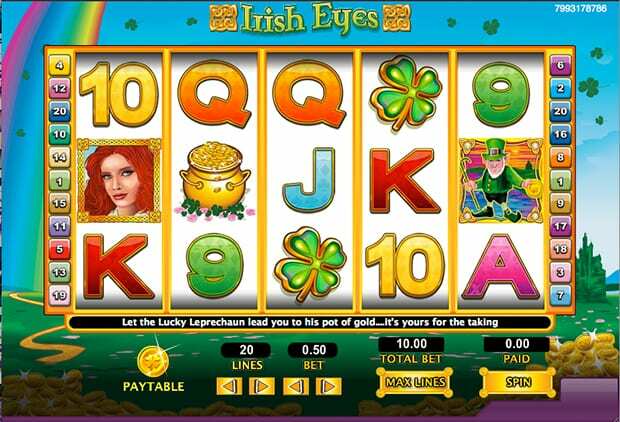 This is your standard Irish slot with a twist, encounter leprechauns, and beautiful virtual Irish girls but you must be prepared to risk it all to have the luck O’ the Irish on your side. Top of the morning to ya! There are more games to choose from, click to see UK slots! You’ll have heard the saying many a time before “the luck of the Irish”. Well, now the luck can be on your side! This is one of the most popular Irish themed online slot games and it has been brought to you by Next Gen /NYX. Why not have a go – maybe a bit of symbolic Irish good fortune will rub off on you! The developers of this game are those big hitters Next Generation. These guys have been around a long time and have a history of producing jaw-dropping entertainment. Their games are typically fun orientated without taking away from the playability and functionality you need to give you a good chance of extended gameplay and significant returns. The game structure is a traditional five reel setup and the Irish theme really is side-splitting and packed full of an Irish fairytale. There are bonus rounds galore too which are guaranteed to keep you entertained for longer. This kept this game to be the best UK video slot ever! Try to land as many leprechauns (wilds) as you can and as many red-haired ladies (scatters) as you dare! These will help you on your way to winning big. Use your Irish charm to caress those reels into giving you the symbols and lines that you’re looking for. Paylines run from left to right in this game and the scatter is fantastic as it multiplies the win by the total amount staked! Look out for 3 scatter ladies appearing left to right and have the chance of winning 12 free games with tripled prizes! It’s an instantly attractive and colourful game. In the background, you’ll see a magical rainbow and the mystical countryside. The main symbols to look out for other than the leprechaun and the lady are pots of gold and clovers. You can stake from as little as £0.01 up to £125 per spin, meaning all budgets are catered for. The bonus features are pretty cool and are probably one of the main reasons why this game has become so popular. There are ample multipliers and free spins to be had! 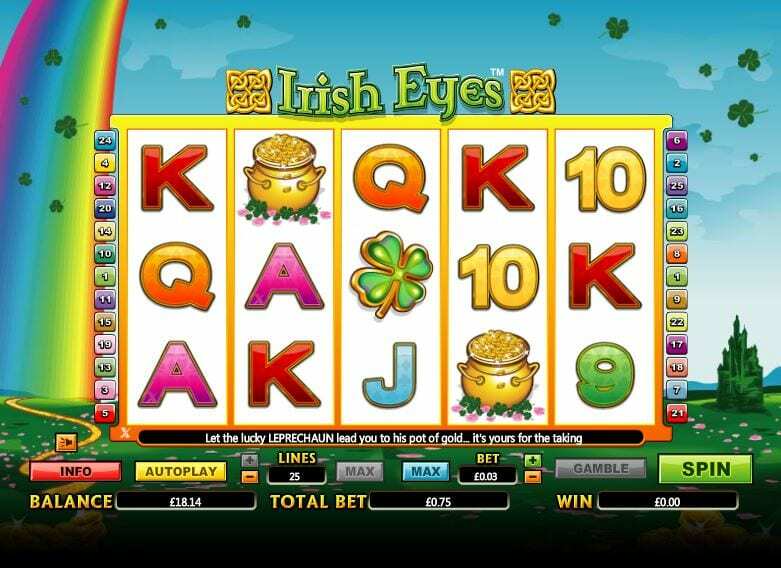 Irish Eyes is a simple but effective slot. It plays well on the legend and on the first impression may seem a bit gimmicky but this probably adds to the appeal. As you get further into the gameplay and more immersed in the slot, the bonus rounds really are quite rewarding and without doubt, the reason why this game has stood the test of time and remained towards the top of the charts in terms of a number of wagers. There are certainly no shortage of other Irish themed slot games out there if you’d like to play around on a few and compare. But history shows that you are likely to gravitate back to this one eventually! 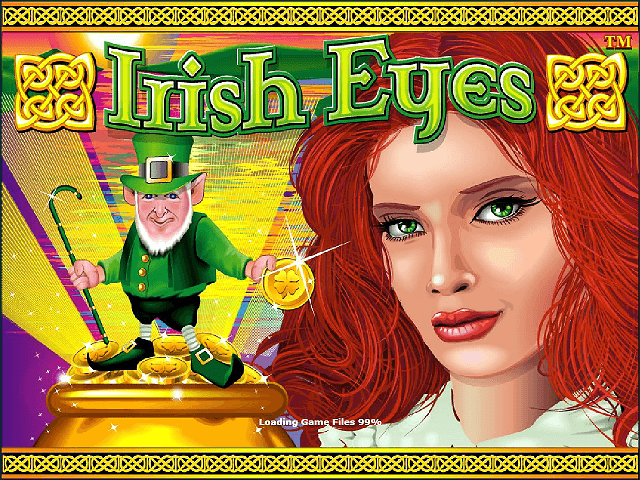 Why not also try the sequel to this game - Irish Eyes 2.